Come in and take a breath. At Earth, Wind & Flowers, our goal is to create an atmosphere where our customers can – quite literally – stop and smell the roses. Everything in our store – from the fresh flowers to our unique gift offerings – is hand-picked by our staff and sold with pride. It is our hope that you will display these items proudly, or pay them forward with love. We also offer a variety of floral decorating services. We are a full-service florist providing the freshest flowers for your party, special occasion or just for everyday to say you care. For your convenience, we will also deliver them right to homes and offices, too! Love to see beautiful flowers flowing from your flower pots but you’re not sure what to put in them? You can bring these containers in and we will fill them up. Too big to bring to us? We will come to you. We take a natural, non-contrived approach to all our flower creations: bouquets, centerpieces, funeral pieces, flowerscapes and more. Each time you visit Earth, Wind & Flowers, we’ll have something new and different for you to explore. We’re constantly searching for exceptional flowers and live plants to catch the eye of those with a green thumb. Looking for that perfect gift? We have items in every price range and we’re always bringing in unique, hand-made items from our featured local artisans. We also carry local seasonal produce including corn, tomatoes, apples, apple cider and cider donuts. Year round, we have fresh eggs from a local farm and we always have Hilltop honey on hand to help combat allergies or to simply enjoy. When the weather gets cool, you can help yourself to a cup of hot mulled cider. Enjoy these items outside on our patio, or take a leisurely stroll through our greenhouse. Despite the seasonal nature of our business, there’s one thing that remains constant, and that is our infinite love of nature. Who is Earth, Wind & Flowers? 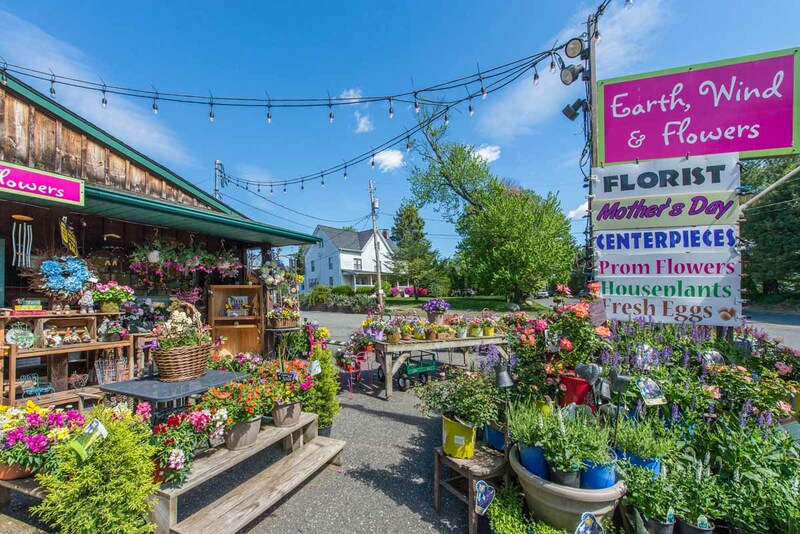 Earth, Wind and Flowers is a garden center and unique gift shop located in East Hanover, New Jersey. Everything in our store has been purposefully chosen, created, crafted or grown with love. We built this garden center and shop as a refuge for people to “stop and take a breath.” Every day, our passion is reflected in everything we create from floral arrangements for weddings, funerals and events to “flowerscaping,” to the gifts we offer and the plants we grow.